모악산에 자리한 금산사는 백제 법왕 2년(600)에 창건된 절로, 통일신라 경덕왕 때 진표가 두 번째로 확장하여 대사찰의 면모를 갖추게 되었다. 금산사 경내의 송대(松臺)에 5층석탑과 나란히 위치한 이 석종은 종 모양의 석탑이다. 매우 넓은 2단의 기단(基壇) 위에 사각형의 돌이 놓이고, 그 위에 탑이 세워졌다. 석종형 탑은 인도의 불탑에서 유래한 것으로 통일신라 후기부터 나타나기 시작한다. 외형이 범종과 비슷해서 석종으로 불린다. 기단의 각 면에는 불상과 수호신인 사천왕상(四天王像)이 새겨져 있다. 특히 아래 기단 네 면에는 인물상이 새겨진 돌기둥이 남아 돌난간이 있었던 자리임을 추측하게 한다. 난간 네 귀퉁이마다 사천왕상이 세워져 있다. 탑신(塔身)을 받치고 있는 넓적한 돌 네 귀에는 사자머리를 새기고 중앙에는 연꽃무늬를 둘렀다. 판석 위에는 종 모양의 탑신이 서 있다. 꼭대기에는 아홉 마리의 용이 머리를 밖으로 향한 모습으로 조각되어 있고 그 위로 연꽃 모양을 새긴 2매의 돌과 둥근 석재를 올려 장식하였다. 기단에 조각을 둔 점과 돌난간을 두르고 사천왕상을 배치한 점 등으로 미루어 불사리를 모신 사리계단으로 해석되고 있다. 이 탑은 가장 오래된 석종으로 조형이 단정하고 조각이 화려한 고려 전기의 작품으로 추정된다. 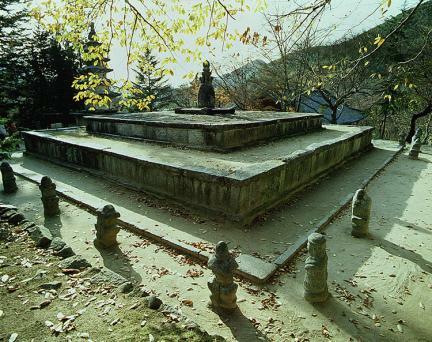 First built in 600 (the second year of the reign of King Beop of the Baekje Dynasty), Geumsansa Temple is a Buddhist temple located on the slopes of Muaksan Mountain. 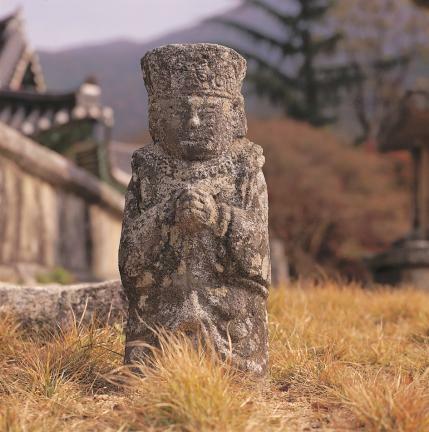 The Buddhist monk Jinpyo enlarged the temple on a grand scale during the reign of King Gyeongdeok of the Unified Silla Dynasty. 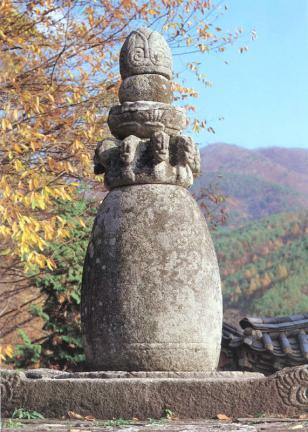 This is a stone pagoda lining abreast the five-story stone pagoda of Songdae in the shape of a stone bell. 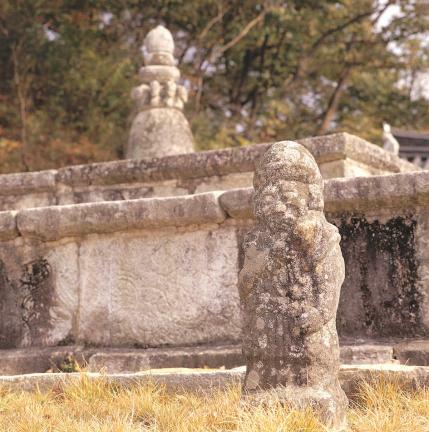 The pagoda stands on the square stone platform on the top of wide-two-story stylobate. The bell-shaped pagoda is believed to have been adapted from the Indian style of Buddhist temple and appeared since the late Silla Dynasty. Since the outlook of the pagoda looks similar to the Buddhist bell, it is also called a "stone bell". Every side of the stylobate is engraved with the images of Buddha and the Four Guardian Kings, the guardians of Buddhist temple. The stone-poles of the lower layer of the stylobate, which probably held stone-railings, have their faces. 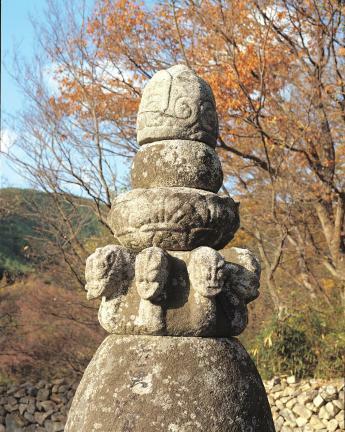 The stone sculptures of the Four Guardian Kings are erected on the four corners of the railings. 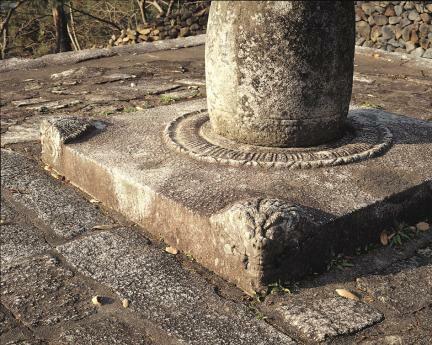 A wide prop that supports the main body of the pagoda has the engraving of the lion face on each edge and that of the lotus flower on the center. 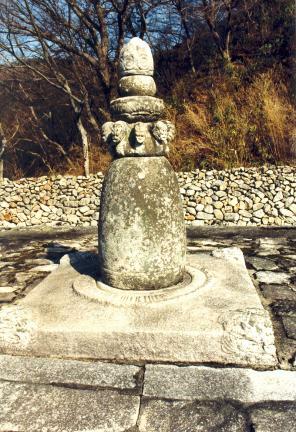 The main body of the pagoda in the shape of a bell stands on the stone platform. On the top part of the pagoda, nine dragons are carved with their heads forwarding out under the two stone plates, and two pieces of stones with engraving of a lotus flower and a round stone are put up. The engraving on the stylobate and the stone railings with the images of the Four Guardian Kings show that there once stood the ordination platform to store the Buddha's own sarira. 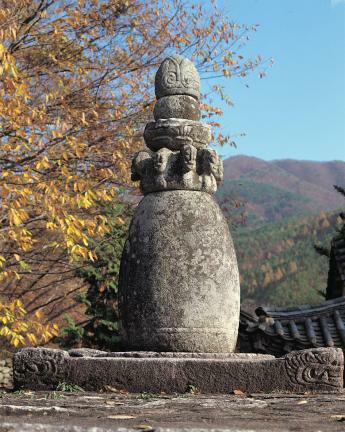 This pagoda is the oldest stone bell still existing in Korea. Judging by the fine structure and the exuberant sculptures decorating the pagoda, historians believe that it was built during the early period of the Goryeo Dynasty.